Experts say there is no one-size-fits-all solution for dealing with this type of tension. Mr Daniel Soh, managing partner at executive search firm Leadership Advisory, says companies should nip the problem in the bud and assess whether the employee has leadership potential. "That should be the first and most important consideration... The companies need to set and share their expectations with the newly promoted individual and he needs to know exactly what is expected of him and not to accept the new role blindly." Larger corporations usually have more established practices to help ease new managers into their roles, says Ms Ng. Examples include conducting induction programmes, training for new managers and strong support from the management team and the HR department. Ultimately, the key to a successful transition depends on having open and clear channels of communication. "Consultation before and after the promotion is key. It is important to be clear as to why one person was promoted over the other... and this must be communicated on a public platform such that all involved are aware," says Ms Ng. She adds that having an avenue for employees to give feedback to the HR department, or a person more senior than the immediate manager, enables unhappy staff to air grievances before they become a bigger problem. 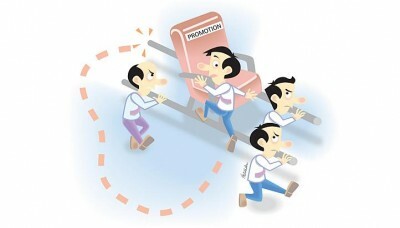 On what newly promoted managers can do, Mr Soh says sincerity and trust are the best tools. "Remind (your team) that you have been in their shoes, and how you're going to do things differently." He adds that being objective and focusing on accountability puts across the message that there is no bias towards any staff member.